OriGene conjugation kits utilize a novel chemistry to generate highly reproducible conjugates with a simple procedure. 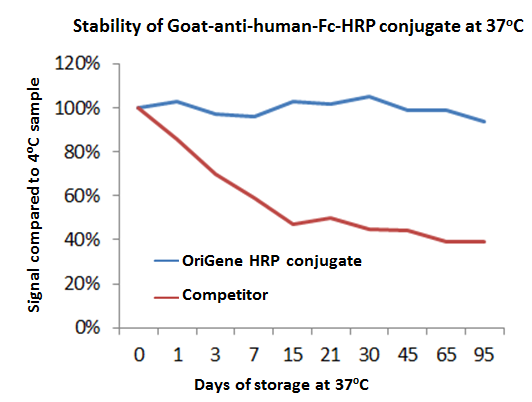 The resulting conjugates have been shown to be extremely stable, retaining nearly 100% activity after storage for 2 months at 37ºC. Each kit includes all reagents needed to biotinylate the stated amount of IgG and a highly pure solution of 100 mg/ml BSA for final formulation. Each kit includes all reagents needed to conjugate the stated amount of IgG at an HRP-IgG ratio of 4:1. The resulting conjugates have been shown to be extremely stable, retaining 100% activity after storage for 2 months at 37º C with concentrations as low as 0.5 μg/mL. Liquid-based reagents - No reconstitution, just Mix and Go! Supplies sufficient activated HRP to conjugate all IgG at a 4:1 HRP:IgG ratio. Highly efficient HRP incorporation - conjugate purification not usually necessary. Customize the HRP:IgG ratio to create optimized conjugates for different applications. Conjugates have greatly improved stability vs Lightning-Link™ and other common chemistries. Each kit includes all reagents needed to conjugate the stated amount of IgG at an RPE:IgG ratio of 1:1. Supplies sufficient activated RPE to conjugate all IgG at a 1:1 RPE:IgG ratio. Highly efficient RPE incorporation – conjugate purification not usually necessary. Customize the RPE:IgG ratio to create optimized conjugates for different applications.